The Thessaloniki Conservatories Board of Alumni organizes during the 6th International Guitar Festival in Thessaloniki a Guitar Competition. The winners will perform in the final concert of the festival on Sunday 5th May 2019. The order of appearance of the contestants in all categories will be determined by lottery which will be held on Saturday 4th May 2019 before the competition starts. The contestants must send the application form until the 28th of April 2019. The registration fee is 60 Euro (sixty) for the fourth (D’) category, 40 Euro for the third (C’) Category and 20 Euro for the other categories. Vassileos Georgiou 26, Thessaloniki 54640 (Greece). The fee cannot be paid back. The competitors shall send the registration application either by post or by email to the festival’s addresses. The performance of the pieces can be done with or without the music sheets. The jury will consist of five members at least. The names of the members will be announced in the beginning of the contest. The jury is responsible for the settlement of any issue that may arise relating to the conduction of the competition. It has the right to interrupt the contestants after the expiration of the maximum duration or even earlier. -If a member of the jury is at the same time the teacher of one of the contestants he cannot participate in the voting of the specific guitarist. -In the event of a tie, it will be another voting. contestants cannot have any financial claim by the use of the recorded/filmed material. The contestants that will win must attend the ceremony on Sunday 5th May 2019. Otherwise, the prize or the praise will be canceled. 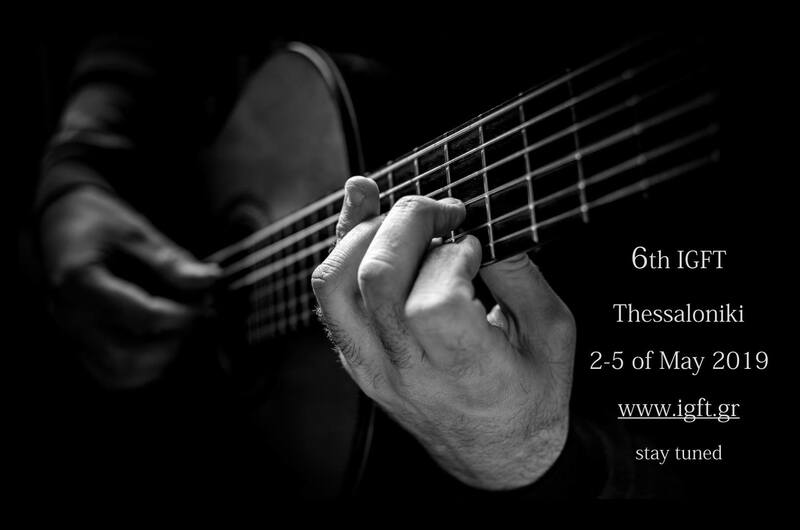 The 6th International Guitar Festival of Thessaloniki will be held in Thessaloniki from 2 to 5 May 2019.